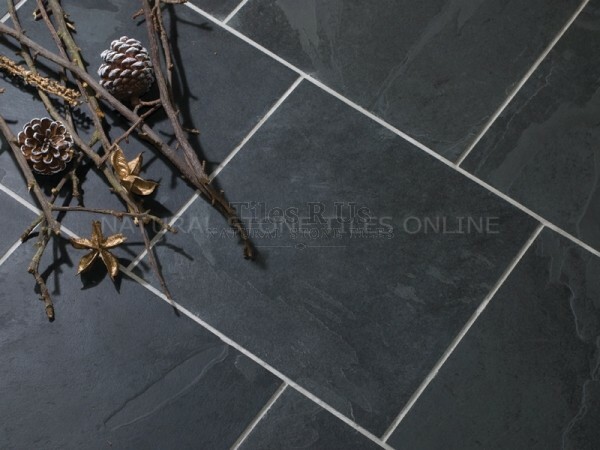 Price is per square metre of tiles (m2) Tile category: Riven SlateProduct Information:- Our Brazilian black slate tiles combine the classical slate character of a textured surface but with minimal variations. We take great care in carefully selecting our riven slate - we use the surface structure to determine which are chosen for our range, slate surface textures are created during the slate formation, the slate splits along the thinner structures thus providing unique surface variations: only natural formation can do this. We present you with a slate tile that has the unique surface variations yet also has a 'smooth' appearance and feel this tile has everything that is required to give a high quality stylish rustic look to your room. 8-11mm thick. This tile is calibrated (planed on underside)Click here to check our TILING ESSENTIALS range including tile sealer, tile cleaner, tile adhesive and tile grout; we only supply carefully selected Tiling Essentials for Tiles R Us. We recommend for this tile: Adhesive: Flexible standard set or fast set adhesives Grout: Flexible narrow joint grout or flexible wide joint grout Tile Sealer: Mattstone tile sealer Tile Cleaner: Grimex stone tile cleaner Tile Maintenance: Waxwash or FloorshineUnder Floor Heating: Click here to see all the details and options available in our Comfy-Toes UNDER FLOOR HEATING rangeWarm comfortable feet - absolute heaven in your kitchen, bathroom, shower room or conservatory! Don't miss the chance to check our low cost, high quality range of floor heating systems.